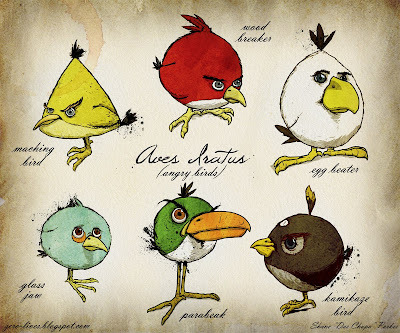 Genus Aves Iratus - Angry Birds ornithological documentation and news of the sequel! Angry Birds seems to have taken over the world, but no-one had documented the genus - until now! Das Chupa has posted this Angry Birds image to the Zero Lives website, a rather magnificent old-style version of the Angry Birds / Genus Aves Iratus species! ...and if this isn't enough, the CEO of Angry Birds producer Rovio, Peter Vesterbacka, announced at the Virtual Goods summit that Angry Birds will soon be available for every gaming platform + a Facebook game is in development + there is an Angry Birds SEQUEL on the way, this time taking the pigs side!